When you see a show a second time, it can feel like you’ve been there, done that. But when you see a show three times or many more, a different and entirely fascinating experience can emerge. 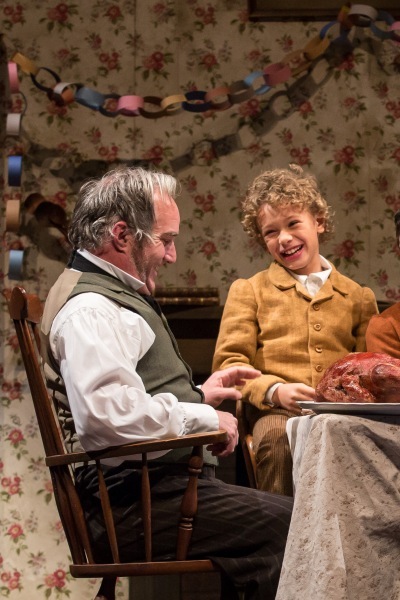 That’s where I am with the Goodman Theatre’s current version of Dickens’ “A Christmas Carol,” where the producers and actors, like the best chefs, are tweaking the recipe for their 39-year-old traditional holiday treat designed for families with chldren age 6 and up. I’m once again won over by the impact that a few fresh ingredients can have on my impression of the whole. This Chicago tradition continues to be worth repeating year over year. For the ninth season, Larry Yando plays the gnarled old man whose very name is now a synonym for miser, his “Bah! Humbug!” an all-purpose slapdown that distills the essence of a curmudgeonly world view. Yando’s wonderfully long face is as capable as ever of rubbery contortions worthy of a cartoonist’s pen. 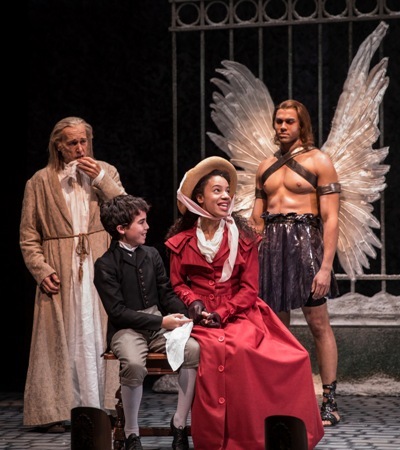 As Yando’s Scrooge is poked and prodded by the specter of his dead partner Marley and three Christmas ghosts into a grudging night of self-discovery, he responds fiercely at first, with a tantrum so big it’s almost beyond words. Then comes the doubt and the wonder, which are pure and almost childlike, too. You can tell from the sympathetic sounds in the audience that all ages can identify with this man’s deep need to grow up; they’re focused on Scrooge’s redemption early on. Also for the ninth season, Ron E. Rains is Scrooge’s long-suffering, underpaid clerk, Bob Cratchit, who’s shivering from the cold as we first come upon him. An instant ally of the youngest attendees, who know a thing or two about being powerless and finding ways around it, Rain’s sweet-tempered Cratchit assigns himself the wordless task of sneaking a single lump of coal into the furnace, provoking a tirade. When Cratchit is cordial to visitors seeking a donation for the poor, Scrooge berates him again, and yet again for wanting all of Christmas Day off, that “poor excuse for picking a man’s pocket” every 25th of December. The innocent comedy of this teller’s good heart thus provides the necessary set-up for the tragic Cratchit family story that’s about to unfold. Over the years, the characters in “A Christmas Carol” have been cast as an increasingly diverse mix of souls reflecting the population of Chicago itself. And in 2013, Todd Rosenthal’s handsome Victorian-era set, with its foggy London gables and towers, gained nifty new places for ghosts to hide as well as some high-tech levitating potential in Scrooge’s bed. Henry Wishcamper, directing the show for the fourth time, is also still tweaking. 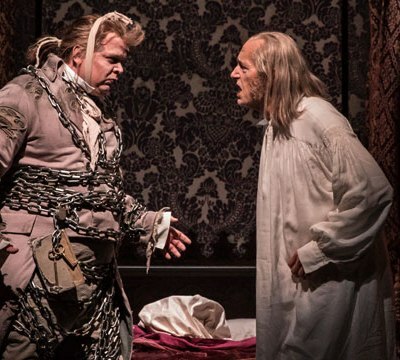 The 2016 version has been amped up to a fairly scarifying decimal level in the scene of Scrooge’s first visitation, by the dead (as a door nail) Jacob Marley, who explodes into Scrooge’s bedchamber to shake some sense into him. After the blasts, I checked around my area to see how the smaller ones were taking it. They seemed OK … not so sure about their elders. A couple of novel casting choices by Wishcamper yielded food for thought. As a young man, Scrooge allows greed get in the way of marrying his first and only love, Belle. 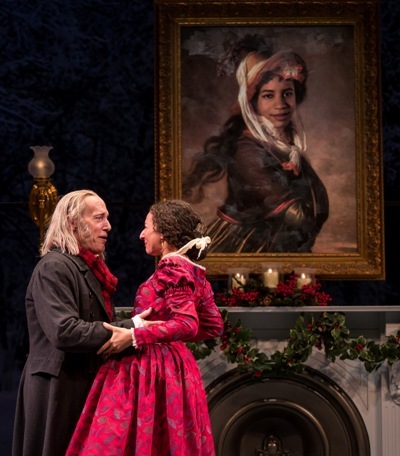 Later in life, Scrooge similarly neglects his nephew — Frederick — although for this production the Goodman changed the role for a young man into a role for a young woman, and Frederick is thus Frida instead. The same actress (lovely Kristina Valada-Viars) plays both Belle and Frida. If the casting reinforced the doleful impact of Scrooge’s harmful neglect, it also doubled the emotional wallop of the old man’s desperate attempt to make things right again. The scene of this fractured family coming together at last was really quite beautiful. The role of the Ghost of Christmas Present was given to a female actor — Kim Schultz — who comes back later in the show as Scrooge’s no-nonsense charwoman. This Ghost’s in-your-face accusations over Scrooge’s obstinate neglect of the needy and ignorant, while pure Dickens, had more than their usual sting. Who knows how the scene might have played in a non-election year, but the dynamic was suddenly interesting, even awkward, in the house on the night I attended, with America’s internecine debate over social blame and responsibility so fresh in memory. The production was smartly cast overall, with many actors returning from previous years. Joe Foust was truly unsettling as Marley’s ghost, still an angry bull in the habit of throwing his weighted shackles around. Kareem Bandealy gave a fine portrait of the young adult Scrooge, drawn to love yet even more attracted to the siren song of cash-strapped companies in distress. John Lister, radiantly jovial, played Scrooge’s long-ago boss Mr. Fezziwig. At Fezziwig’s party, violinist Andrew Coil did an extended virtuosic turn that drew hearty applause. 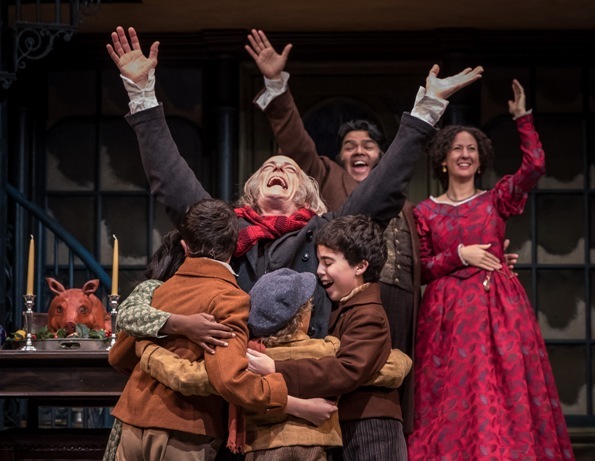 Sadieh Rifai put some passionate backbone into the role of Bob Cratchit’s wife, and Nathaniel Buescher, as their Tiny Tim, projected the touching authority of a well-loved if sickly child. Travis A. Knight looked as if he had just stepped out of a Renaissance chapel fresco, so stunningly graceful was his Ghost of Christmas Past, feathered wings and all. Knight also played the Ghost of Christmas Future in this newly tweaked “A Christmas Carol.” He’s was under a cloak and I begrudge Knight nothing for this, but I must confess I miss the old – truly gigantesque – Ghost of Christmas Past, a bleak and faceless puppet, shrouded in black, which seemed a thousand feet tall and threatened imminent doom as Scrooge’s tombstone emerged ominously from the fog. Too gruesome? On balance, I think not. The happy end is only moments away.